Funny thing about remaking a game into 3D is that when you want to advertise the main titular enhancement, you really can't. That's always been an issue with the Nintendo 3DS, but I think we all get the idea. Nintendo has joined the "comparison video" craze yet again, showing off the new look of Majora's Mask 3D right next to the original Nintendo 64 release. Seriously, between Pokemon Omega Ruby and Alpha Sapphire, Grand Theft Auto V, and the rest of the HD remasters out there, I wouldn't be surprised if the video game industry caused me to experience deja vu in my real life! Even without being able to see the 3D, the jump in quality is noticeable. Much like in the Ocarina of Time 3D remake, Link is more expressive with smoother body animation and a more detailed face, and the other characters he meets on his journey are more than a grouping of discernible blobs. 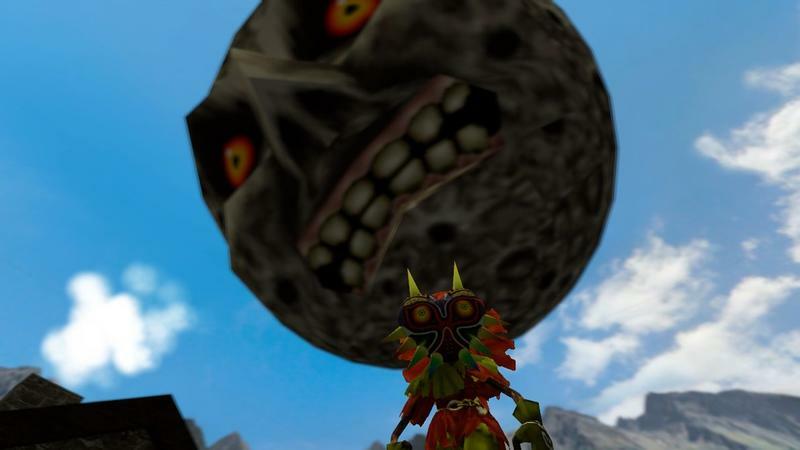 So yes, even though we can't see the 3D, Majora's Mask 3D is going to be worth your time and money. Who buys these games for the 3D anyway? I just want easy access to all of these old games in the palm of my hand at the tap of a touch screen. Majora's Mask 3D will be released for the Nintendo 3DS in spring 2015. With its release, what is next up on the remake front of Zelda? Or should we just be looking forward to the astounding looking Wii U game?